Two weeks ago, in honor or our birthdays (my husband and I both had one in June) the “kids” (my mom and uncle) decided to treat us to a weekend in Vegas. The only issue…they were coming with us. As I’ve mentioned in the past it’s always an adventure going anywhere with the “kids”…well this time it was even worse. We flew…and for some reason, the “kids” don’t normally fly. I have no idea why…but after this trip I won’t question it any more. For everyone’s sake; the check in clerk, the TSA agent, and even the stewardess (who had to promise them cookies if they were quiet through the flight), it’s probably better they don’t. Weeks before we even left I started getting emails with pictures of suitcases..."do you think these suitcases will work?" For two people that don't travel much, they sure have a lot of suitcases to choose from. Let me tell you it wasn’t fun going through airport security with these two. A million questions were asked…actually it was more like the same question asked a million different ways… “by no liquids allowed do they mean…” Yes, there were times (several) that I pretended not to know who they were. Like when my mother was randomly selected to be searched…that poor guard didn’t know what he was in for when he picked her. 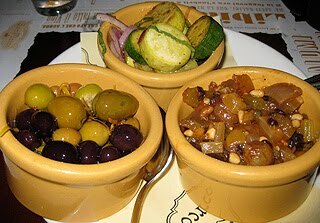 Mixed Appetizers at Enoteca San Marco in the Venetian. 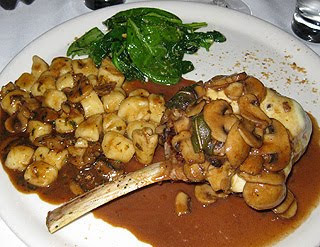 The Veal chop at Café Mortorano’s in the Rio. Margherita pizza also at Enoteca San Marco. We also had two of the most amazing salads ever at B&B in the Venetian (unfortunately I don’t have pictures): baby greens topped with fresh porcini mushrooms and shaved parmesan cheese. And a cucumber salad topped with pork belly in a lemon garlic vinaigrette. Both were like heaven on a plate. My mother claims she’s ready to fly again…but I’m just not sure the world is. Hey I just made that pizza and posted it on Monday! That pizza looks divine! 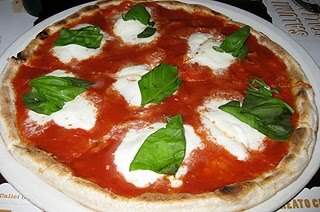 I love a simple, thin crust margherita...I'm hungry just looking at it. The food looks great and your story is hilarious! Too funny! Your experience with your mom sounds so much like my experiences with my mom...this is why I don't take her traveling. I'm glad to see the food looks good! Thanks for stopping by our blog - I had to laugh at your experience "flying" - trust me, you don't have exclusivity on the crazy making. I think the trick is to pretend you don't know them. I am sure you had a great time except of the airplane time. That margherita pizza looks awesome!! Margerita is definitely my favorite type of pizza. Sounds like a fun trip and an interesting airport experience. Too funny! My parent's are like that when they fly. Love them, but I'm answering a lot of questions and my mom always likes to whip out the camera on the flight. We love Vegas and skipped a trip this year, but hopefully we'll make it back in 2011. Your eats look great!